Home / Archive / Football streamed for free: what are the alternatives? Football streamed for free: what are the alternatives? Football fans were recently disappointed when the ITV Player failed during the first night of coverage from the FIFA World Cup. Both services referred to are ad-funded and an advert must be viewed before the stream starts. This also applies to BBC channels. Offers live streams from all of main terrestrial networks. After legal action against the company from some broadcasters, which affected the provision of some channels, BBC One, BBC Two, ITV, Channel 4 and 5 could continue to be offered legally. TV Catchup also carries the national variations of BBC One for Scotland, Wales and Northern Ireland. It doesn't carry ITV4, which will be home to some World Cup coverage. The website has a layout that is relatively busy compared to TVPlayer (below), yet is quite easy to navigate. 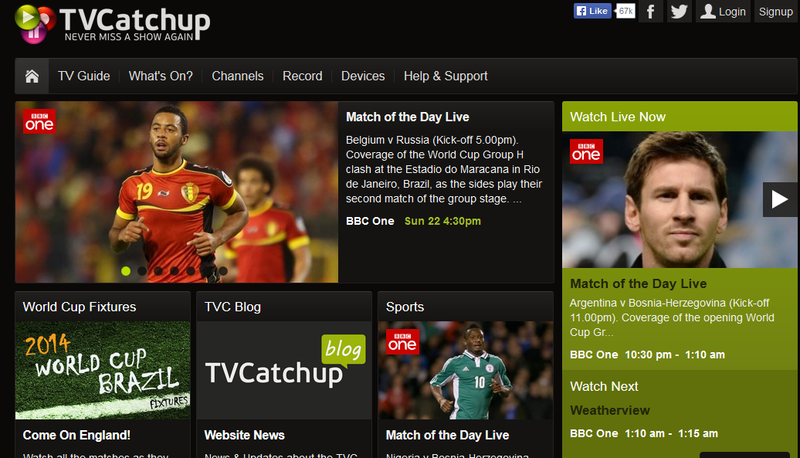 On mobiles and tablets, TVCatchup is available on all major platforms. Streaming of the main channels via 3G is possible. During testing, a516digital found the 3G experience hit and miss - there is likely to be more issues with mobile network capacity, signal strengths etc using 3G. 4G (where available) is more suitable. Ultimately wi-fi provides the most consistent experience for the majority of users. Remember that streaming over 3G/4G will dig deep into your mobile data allowance (where applicable). The new kid on the block, TVPlayer offers live streams containing the London versions of BBC One, BBC Three and ITV. Like TVCatchup, ITV4 isn't available. It's a very simple and uncluttered website, and your eye is drawn quite quickly to the "watch now" link at the top for the live streams. On mobiles and tablets, TVPlayer is available on all major platforms. 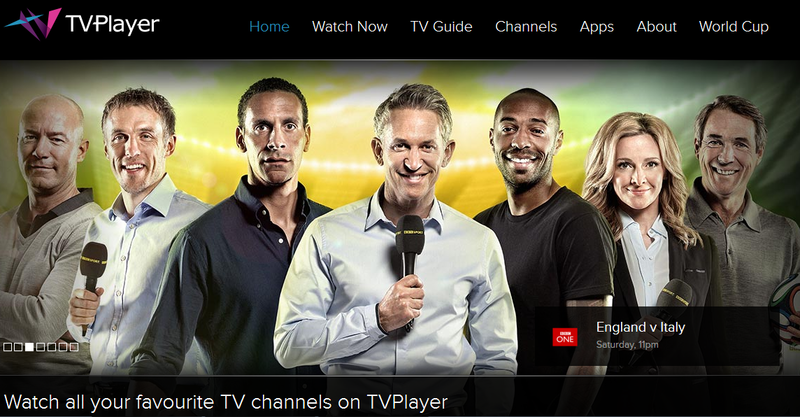 Access to the live streams of BBC channels, plus ITV, Channel 4 and 5 is currently only available over wi-fi. There's been trouble with some previous app versions; the most recent app update has fixed some issues - but during testing of the latest version on Android, a516digital was left without BBC One unless going to the World Cup coverage feature in the "don't miss" tab. During testing, a516digital found that TVCatchup offered a better mobile experience, especially because you could stream the football while on a 3G/4G network, but for those of you stuck at a desktop PC or laptop and nowhere near a TV, TVPlayer inched ahead with its simple and clean website layout. There are other sites that stream UK channels from abroad. With some broadcasters having had to suspend certain satellite transmissions during the World Cup due to broadcast rights issues with FIFA and exclusive rights deals with broadcasters in some countries, internet sites that stream UK channels to anyone, anywhere in the world are not on legal safe ground with FIFA. a516digital can't recommend any of these sites. Since this article was published, sources in the industry have contacted a516digital saying that the provision of BBC One, Two, ITV, Channel 4 and 5 via 3G/4G contravenes the law. The section 73 cable exemption relied upon to stream PSB channels specifically prohibits streaming via 3G or 4G.